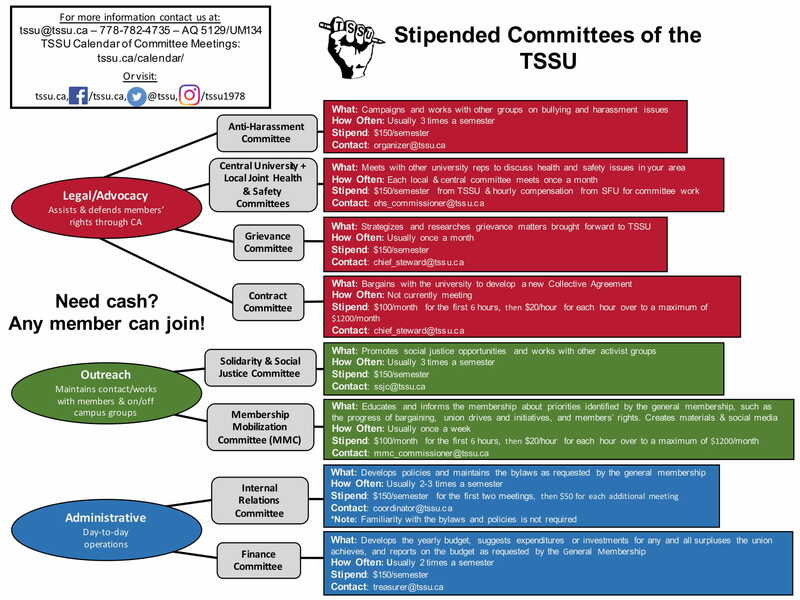 All TSSU members are welcome to join any of TSSU’s standing committees. Each committee has a different area of focus or interest. To join a committee, email tssu@tssu.ca or see below for contact details of specific committees. General Membership meetings run three times a semester, and you can be ratified to committees during any General Membership meeting. After ratification, you are a member of the committee and may claim a stipend if eligible. See our calendar for details of both General Membership meetings and committee meetings. As a committee member, you decide how many tasks and responsibilities you’d like to take on — the amount and nature of the work is up to you. You are also free to end your membership of a committee at any time. All members who regularly participate with a committee are eligible for a stipend. The stipend for most committees is $150/semester – see the explanation of individual committees below for more information. Additionally, members are welcome (and encouraged) to attend and contribute to any committee meetings, although they will not be able to vote on motions or claim a stipend unless they have been ratified to the committee already. For requesting stipends, committee stipend forms can be found in the display outside the TSSU office (AQ 5129), or on the TSSU website. First-time volunteers with TSSU should also complete a Volunteer Information Form. Once completed, submit the forms in the office or by email to coordinator@tssu.ca. All members in good standing sit de facto on the General Membership committee, which sets the goals and priorities of the union. This committee is not stipended and is chaired by the TSSU Chair. Meetings occur three times a semester, and a free meal is always provided. Members in attendance can discuss and vote on motions to determine the union’s activities. If you would like to propose an agenda item or motion for consideration by the General Membership, please contact chair@tssu.ca. Motions leading to a change in TSSU’s By-Laws must be announced at a GM, to be voted on at the subsequent GM. The Anti-Harassment Committee campaigns and works with other groups on bullying and harassment issues at SFU. The committee meets an average of three times a semester, and the stipend is $150/semester. For more information or to get involved, please see TSSU’s campaign page on harassment and email chair@tssu.ca. The Contract Committee was formed by membership vote at the February and March General Membership Meetings. Its main role is to bargain for a new Collective Agreement with the Employer. In June 2018, the Contract Committee designed and sent out a membership survey; based on the results, the committee is now developing proposals to improve our Collective Agreement in the lead up to its expiry on April 30, 2019. Contract Committee meetings and bargaining sessions are open to all members, and details are available on the TSSU public calendar. The stipend is $150/month for the first 12 hours of work, and then $20/hour for each hour over to a maximum of $1200/month; hourly totals do not roll over between months. For more information about Contract Committee or the bargaining process, email chief_steward@tssu.ca. The Finance Committee develops the yearly budget, suggests expenditures or investments for any and all surpluses the union achieves, and reports on the budget as requested by the General Membership. The committee meets one or two times a semester, and the stipend is $150/semester. For more information or to get involved, email treasurer@tssu.ca. The Grievance Committee strategizes and researches grievance matters brought forward to TSSU. Complaints are dealt with via the grievance processes set out in the Collective Agreement. The committee meets an average of once a month, and the stipend is $150/semester. For more information or to get involved, email chief_steward@tssu.ca. The Internal Relations Committee (IR) develops and maintains the By-Laws and Policies as requested by the General Membership. Throughout Summer 2018, the committee has undertaken a systematic review of the By-Laws and Policies to ensure that TSSU’s governing documents are consistent with its goals; this work will continue into Fall 2018. Prior familiarity with the By-Laws & Policies is not required for potential members of the committee. The committee meets approximately once a month, and the stipend is $150/semester for the first two meetings, and $50 for each additional meeting within a semester. For more information or to get involved, email coordinator@tssu.ca. MMC educates and informs the membership about priorities identified by the General Membership. These include the progress of bargaining, union drives and initiatives, and members’ rights. The committee also creates materials and social media. The committee meets as often as once a week, and has a special stipend schedule to reflect this: the stipend is $100/month for the first 6 hours of work, and then $20/hour for each hour over to a maximum of $1200/month. Hourly totals do not roll over between months. Monthly totals will not be allowed to roll over into next month’s totals. For more information or to get involved, email mmc_commissioner@tssu.ca. The Solidarity & Social Justice committee promotes social justice opportunities and works with other activist groups, both at and outside of SFU, and makes financial donations to community organizations. The committee meets an average of three times a semester, and the stipend is $150/semester. For more information or to get involved, email ssjc@tssu.ca. At SFU there are 11 different Local Joint Health & Safety committees, each representing a different area of campus, and TSSU has access to seven of the committees. More members are needed to take part! Meetings are held three times a semester, and the stipend is $150/semester from TSSU, along with hourly compensation from SFU for committee work. The role involves reviewing health & safety reports at the meeting, bringing issues from TSSU to the group, reporting back to the TSSU, and using your own experience to contribute to the general health and safety at SFU. Click here for the list of buildings represented by each committee. You do not need to have worked in the building/area connected to the committee to be a member. You will be briefed by TSSU thoroughly and provided a free Health and Safety Course of training for signing up. For more information or to get involved, email ohs_commissioner@tssu.ca. The Executive committee consists of elected members, but as with other TSSU committees, any member can attend Executive meetings. Executive officers implement policy as determined by the membership, and their duties are outlined in the By-Laws & Policies. Executive officers must participate actively on committees (including the Executive), and the stipend is $360/semester (except the Treasurer stipend, which is $1120/semester). The Executive committee meets an average of twice a month. See here for more information on the duties and elected members of the Executive Committee. Elections occur twice a year for Executive positions. All TSSU members can vote and/or run for Executive positions. The Stewards committee consists of departmental stewards who act as liaisons between the department (or school or faculty) and TSSU. Stewards represent up to twenty employees in each department. Stewards are elected by their departmental caucus, and are required to report to the caucus and to the Stewards committee as necessary. Stewards meet three times a semester, and the stipend is $250/semester. For more information or to get involved, see the Stewards page or email chief_steward@tssu.ca. TSSU has four positions on the VDLC. Elections for these four positions happen at the January GM, with nominations opening at the November GM. Duties include attending and representing TSSU at these meetings, and reporting any relevant business back to TSSU. Meetings are held on the third Tuesday of each month at 7:30 PM, and the position is stipended at $150/semester. For more information, email organizer@tssu.ca.